There’s a 1200-foot asteroid headed straight for the Earth. You’ve got five days to come up with a plan, or go the way of the dinosaurs. This isn’t the script for the Day After Tomorrow sequel — it’s the scenario being war-gamed by a roomful of PhDs as we speak. The Planetary Defense Conference is a meeting of scientists, engineers, policy-makers, and people who don’t want to be crushed by asteroids currently taking place in Frascati, Italy. It looks like most other scientific conferences — papers, seminars, lots of people with nametags getting lost — but with one crucial difference: the asteroid war-games. A recently discovered near-Earth asteroid is predicted to pass very close to the Earth on September 3, 2022. The asteroid, designated 2015 PDC, was discovered on April 13, 2015, and has been tracked continuously over the last two months by observatories around the world. Predictions for the asteroid’s encounter in 2022 indicate that, while unlikely, an Earth impact cannot be ruled out. The current likelihood of impact is about 0.9% or 1 chance in 110, according to the International Asteroid Warning Network (IAWN), a worldwide partnership of agencies that detect, monitor and track potentially hazardous asteroids. As each day goes by, the teams are drip-fed a little more information. By Day 2, we’re at April 4th, 2016, and the chance of asteroid impact is 43%. In other words, things are getting real. A 1200-foot asteroid impact doesn’t sound like the end of the world — and technically, it’s not. According to Matt Holman, the Director of the Minor Planet Center at the Smithsonian, an asteroid that size wouldn’t be the end of the life — but it would still be a disaster of epic proportions. How epic? 2250 megatons, or the equivalent of 2250 million tons of TNT. To give you a sense of scale, the biggest nuclear device ever detonated, the Tsar Bomba, was 50 megatons. The 2013 Chelyabinsk meteor that hit Russia was 50-60 feet wide, with an energy of 0.5 megatons. 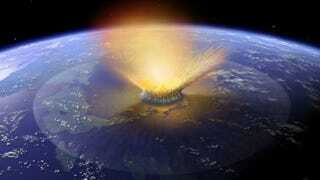 The asteroid would create an impact crater 5-7km wide, 500 meters deep, creating a 6.8 magnitude earthquake. Everything within 20 miles would be totally destroyed, whilst fireballs and 140mph winds stretch out to 100 miles. Still, it’s not the worst-case scenario. That honor goes to the asteroid impacting at sea. Depending on the angle of impact, the asteroid could cause a tsunami generating 20-foot high waves along the coast of an entire continent. So what do we do? Our possible courses of action mostly depend on how long we’ve got, and the size of the asteroid. For asteroid 2015 PDC, humanity has until 2022 to try to neutralize the danger. With an asteroid its size, just firing an oversized missile to shatter it would be a bad idea: chunks big enough to enter our atomsphere would still be floating around, but in a manner too haphazard to predict, turning our planet into one big crash site. You don’t really try to change its direction. Imagine it like an intersection — there’s going to be a point in time where the asteroid and the Earth are in the same place. You can’t change the roads that they’re on, but you can speed it up or slow it down, so that they avoid one another. In essence, deflection involves speeding up or slowing down the asteroid so that it misses the Earth. To change its velocity, you’ve got a number of options. One way — the most basic — is to approach with a nuclear device and detonate it nearby. That would vaporize part of the asteroid, and the effect of material vaporizing off the surface would exert pressure on the main body, thus changing the velocity. Another option is a space-based laser, mounted on a satellite, which would similarly fry the asteroid, vaporizing material and achieving the same outcome. Other options include impacting the asteroid with a satellite, transferring kinetic energy the old-fashioned way, like an intergalactic game of pool. Finally, of course, you could land a spacecraft on the asteroid itself, fire up a rocket, and push it off course that way. When dealing with a timeframe of months, not years, the list of working solutions decreases dramatically. According to a 2013 study, the only practical solution for an asteroid a year away is nuclear — firing a small rocket into the surface of the asteroid, and following up with a nuclear missile, which would hopefully fragment the asteroid whilst not showering our planet with chunks of flaming stone. Back in Italy, the teams have been working hard to find the best solution to the half-kilometer problem flying towards the planet. The first two days (in real terms: 18 months) were spent ‘tracking’ 2015 PDC, upgrading the possibility of impact from 40 to 100 percent, and calculating the impact corridor — the red band along which the asteroid could possibly hit. By Day 3 (December 2016), plans are in place to launch kinetic impactors, non-explosive spacecraft which would impact the asteroid and push it off course. Doomsday has been calculated for September 3, 2022, with the list of countries in danger including the Philippines, Vietnam, Laos, Thailand, Myanmar, Bangladesh, India, Afghanistan, Pakistan, Iran, Iraq and Turkey. One interesting — and highly realistic — aspect of the asteroid scenario is the media relations and geopolitics playing out every day. Conference attendees have colour-coded lanyards: red for world leaders, green for media, with others for scientists and members of the public. In addition to working out the physics to defeat the asteroid, the teams have to work out the delicate geopolitics (that list of at-risk nations isn’t exactly the most stable), and work out the best media plan to inform the public, without boosting the membership of doomsday cults too much. As of this morning (aka August 1, 2019), six Kinetic Impactors are on the launchpad, ready for liftoff later in the month. In total, they only need to change the velocity by one inch per second, but we won’t know whether the mission has succeeded until 2020 (or, tomorrow morning). The last daily update will be posted at the NEO website tomorrow morning; until then, you’ve still got time to work on your doomsday shelter.